Sharxkin Dry 9" x 11" Sanding Sheets give you the versatility to use them on lacquers and other wet coatings, or to use them dry on wood surfaces for smooth, even results. Turners prefer these papers for lathe work because of their excellent flexibility. Whether your project involves metal, wood or plastic, Sharxkin Wet-Dry Sandpaper Sheets are well-suited for the exacting work that has become your trademark. 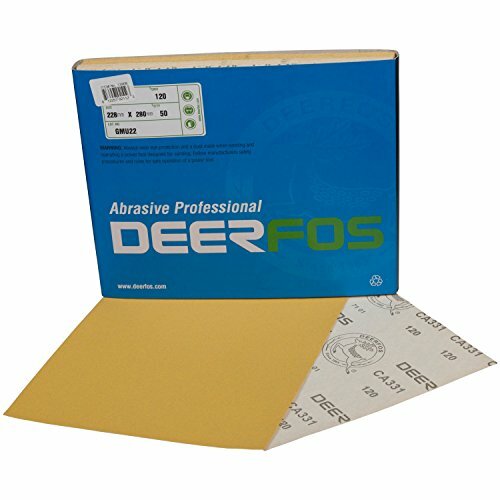 Sharxkin Dry Sanding Sheets uses resilient resin-over-resin bonding on C-weight paper backing for lightweight flexibility. Shard-like grains of silicon carbide cut glass, plastic and metal with just light pressure. Our revolutionary waterproof coating allows Sharxkin Sandpaper Sheets to withstand both water and oil, making it particularly suitable for final color sanding of auto body paint. Each 9" x 11" sheet can be cut into pieces for use with sanding block or jitterbug type sanders. With 12 grits to choose from, you are assured of achieving professional-looking results with Sharxkin Sanding Sheets. We pride ourselves on supplying high-quality products at affordable prices, and providing exemplary customer service. Our 30-Day Money-Back Guarantee ensures your satisfaction. If this product does not perform to your expectations, return it within 30 days of purchase for a full refund, no questions asked. Trust your woodworking and automotive repair projects to the most versatile and reliable abrasive product. Add Sharxkin Dry Sanding Sheets 50-Count Pack to your cart today. SPECIALLY TREATED sandpaper sheets can be used dry for automotive sanding, on wood for professional-quality finishing. Each box contains 50 sheets of high-performance Sharxkin sandpaper. GRIT rub out film finishes like lacquer and shellac, and for smoothing a finish between coats. Sharper than standard aluminum oxide, it cuts quickly for a uniform scratch pattern. C-Wt BACKING PAPER let you use these 9" x 11" sheets in dry, and are suitable for lacquered surfaces as well as metal and wood. Available in multiple grits. RESIN-OVER-RESIN BONDING on C-weight paper backing provides lightweight flexibility for hand-sanding of contoured or irregular surfaces. Ideal for woodworking, auto body repair and furniture restoration. If you have any questions about this product by Deerfos, contact us by completing and submitting the form below. If you are looking for a specif part number, please include it with your message.